The well being of the land is directly tied to the well being of its inhabitants. Providing rural people and poor farmers with the opportunity to earn sustainable, stable livelihoods will help conserve the planet's biodiversity. As much as 90% of the biodiversity resources in the tropics are located in human dominated or working landscapes. When land scapes are increasingly being fragmented and remaining patches of natural vegetation are reduced to isolated habi tat islands consequent to population pressure and human activities, mixed species agroforestry systems could play a significant role in helping to maintain a higher level of biodiversity and provide greater landscape connectivity. 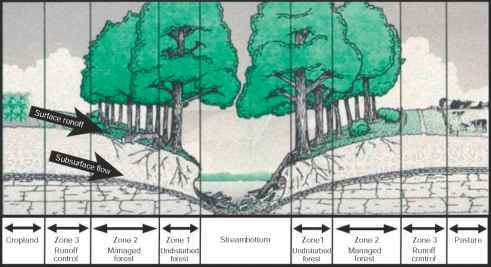 Agroforestry impinges on biodiversity in working land scapes in at least three ways. First, the intensification of agroforestry systems can reduce exploitation of nearby or even distant protected areas. Second, the expansion of agroforestry systems into traditional farmlands can increase biodiversity in working landscapes. Third, agroforestry development may increase the species and within species diversity of trees in farming systems. Another promising aspect of agroforestry in the context of biodi versity conservation is in growing commercial crops such as coffee (Coffea spp.) and cacao (Theobroma cacao), known as shaded perennial systems in the agroforestry literature. This is projected to start a trend of combining environ mental research with consumer products, which could then have a large impact on global conservation. In the temperate regions too, agroforestry can augment the supply of forest habitat and provide greater landscape connectivity. Where croplands occupy most ofthe landscape, riparian forest buffers and field shelterbelts can be essential for maintaining plant and animal biodiversity, especially under a changing climate scenario. A comprehensive assess ment of shelterbelt agroforestry systems in the northern Great Plains of the USA has clearly demonstrated their importance on breeding bird species richness and commu nity composition at both the farm and landscape levels.